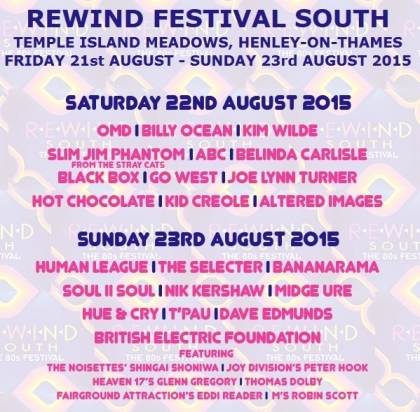 Rewind – The World’s Biggest 80s Festival returns for its seventh consecutive year from Friday 21st August – Sunday 23rd August 2015 at Temple Island Meadows, Henley-on-Thames. Tickets go on sale at 9am on Friday 23rd January 2015. Full details about ticket outlets and prices are available from the official Rewind website: www.rewindfestival.com. Rewind attracts 40,000 festival-goers and has sold out in advance during the last three years. As with the previous star-studded Rewind Festivals, this year’s Henley weekend extravaganza features another outstanding line-up of iconic 80s recording artists and performers. This year’s Rewind sees the debut of several 80s artists including Black Box, Dave Edmunds, and Slim Jim Phantom from the Stray Cats. One of the biggest highlights at this year’s Rewind South is the debut of the British Electric Foundation. B.E.F. is the brainchild of Heaven 17’s Martyn Ware, and will showcase a unique and dazzling performance featuring a raft of legendary pop artists. Ware has assembled a stellar line-up featuring the full Heaven 17 band performing songs made famous by the stars themselves, plus cover versions in the inimitable B.E.F. electronic pop style featuring Robin Scott (M), Thomas Dolby, Eddie Reader (Fairground Attraction), Peter Hook (New Order), Shingai Shoniwa (The Noisettes), and Heaven 17’s lead singer, Glenn Gregory. This one-off 80’s themed electronic extravaganza promises to be a hit-packed highlight of the entire weekend. Don’t miss it! In addition to the rollercoaster, jam-packed August weekend of non-stop 80s music, Rewind Festival will also features loads of additional highlights including the Silent Disco, Live Karaoke Bar, plus Camping and Glamping (aka Glamorous Camping) options. Other festival highlights include the Bump Roller Disco. Legwarmers at the ready… Hire some skates and go for a whirl around the BUMP Roller Disco rink to the sound of your favourite 80s throwback tunes. For the ultimate festival experience at Rewind this summer order a When Nature Calls wristband – posh loos cleaned after every use with warm water hand washing facilities and mirrors now housed under a luxury stretch marquee with café and chill out zone.